The Apple Concept Store at Federation Square does not make sense to me. It does not make sense to give over part of our public urban space to a corporation. The government misunderstands Federation Square as a shopping precinct in search for an anchor tenant. I acknowledge that Federation Square was first conceived of as a commercial public space, however, it has evolved into something that Melbourne really needs. It’s a public urban space where the retail component is ancillary to its primary function. With compromises to the State Library Forecourt and City Square as well as increases in our urban population – we need public urban space more than ever. Apple is not an inclusive company that extends the hand of friendship to anything or anyone who does not abide by its style guide. In part, Apple has become the tech giant by being uncompromising stalwarts for a design aesthetic. They have redefined how we live, work and play. They are brilliant at making technology accessible and they know about brand excellence. Unfortunately, their brand does not translate very well to architecture or urban design. Urban design is messy, and the design principles that makes for a beautiful piece of technology – does not make for a building type in a busy public space. 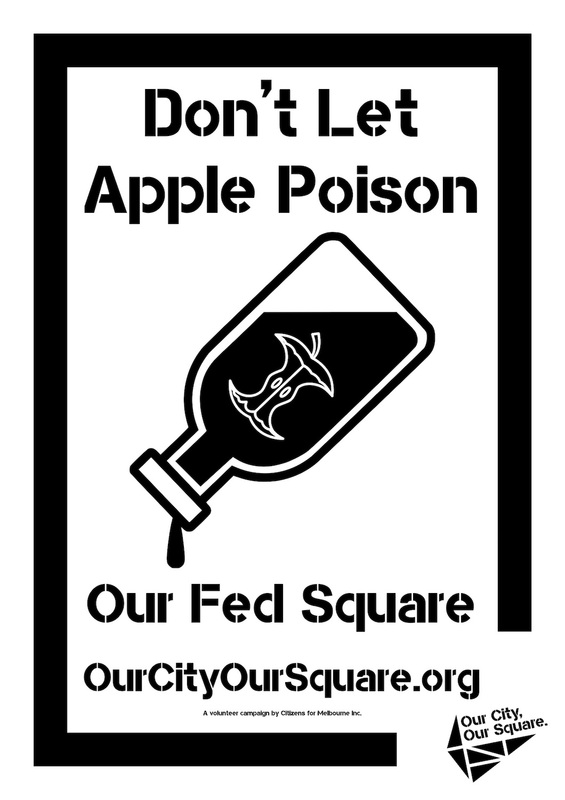 In the context of Federation Square – the proposed Apple Concept Store will appear incongruous and leave open future opportunities to erode the architecture of Federation Square. Like other clever brands Apple selfishly wants to attach itself to places and events that are good. By association we eventually link that which is good to the brand. I do not expect Apple CEO, Tim Cook or our Premier, Daniel Andrews will agree with me. The problem is that our views do not matter and there is no process in which to meaningfully debate the issues. I do not understand is why the government would not adhere to some kind of a consultation process and allow the public the right to voice their concerns (or support) for the proposal. Why have a consultation process that is part of the planning system to allow for a constructive decision-making process? Why is this project too important to allow for a proper consultation process to occur? Why have a planning process if its application is discretionary? What also surprises me is that the architect for the original buildings at Federation Square thinks it’s okay to demolish part of the complex that he created. I respect Don Bates view – but I don’t understand how he and other professionals think it is okay to demolish a recent building and replace it with a building that demonstrates a disregard for our city. The government have relied on their approval for the Apple Store project. However, we should remember that, at the time, Don Bates was one of two directors and that LAB completed the project in partnership with Bates Smart. And that there were many other contributors to the design and implementation of Federation Square – who like the public have no voice in its future. So, let’s ask a question – who created Federation Square? Who made the public space a vibrant thriving place for Melburnians to enjoy? I believe the architects and designers played a significant role, however, just as importantly, it has been the Victorian public who funded and use Federation Square. They created it by being there and showing up on a daily basis. 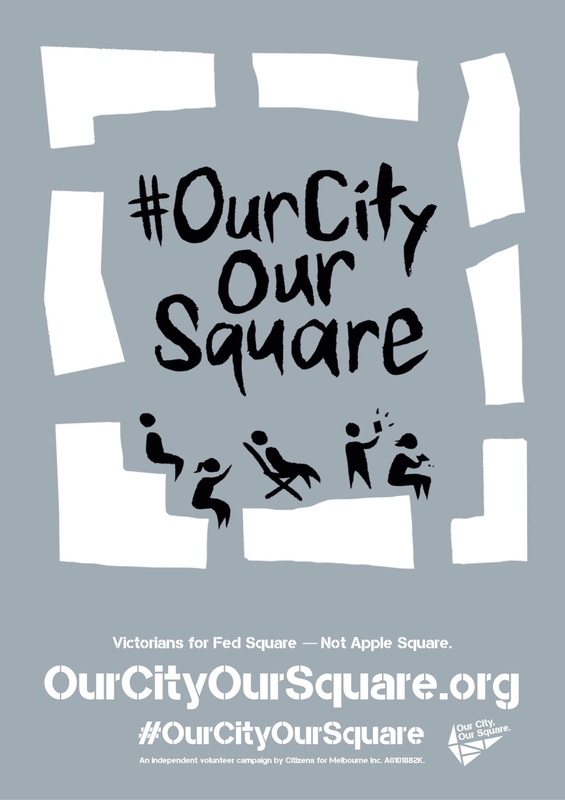 They created Federation Square by embracing the open space for what it is worth. It is how public spaces are made – people show up and over time these places evolve and take on a life of their own. In turn good public places enrich the experience and identity of the city. Federation Square is one place in Melbourne’s context to come together and express a sense of collective identity. It is a place that enhances our cultural and community well-being. Melbournians have created a vibrancy and it is the Melbourne public who should have some say in its future. And in reality we need to go one step further – this project is not a NIMBY thing where local residents will protest. It’s not that kind of project. I believe design professionals need to be vocal, to advocate for the preservation of public urban space and for proper planning processes to be maintained. We do not need another iconic building bestowed upon us. Melbourne simply needs space, buildings that frame public urban spaces and to provide safe open places away from traffic to enjoy sunshine and fresh air. We need to maintain a genuine public realm – away from commercial experiences that have saturated our city. Beyond Why - Taking on Simon Sinek's "Start With Why"